Yesterday was the anniversary of David’s third year in Canada. THREE YEARS! It’s funny, when we were apart, three years felt like forever, but now that we’ve had three years together, it’s gone by in a flash. We’ve had so many great experiences together, like taking a leave of absence in Southeast Asia and having our gorgeous baby boy, Jack. I count myself incredibly lucky to have this great guy here with me, in what is now ‘our’ country. 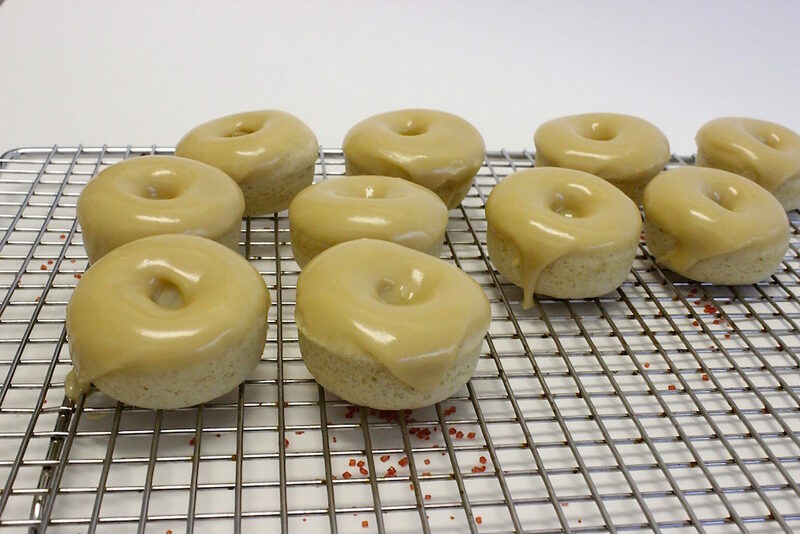 Why with homemade maple glazed mini doughtnuts, of course! 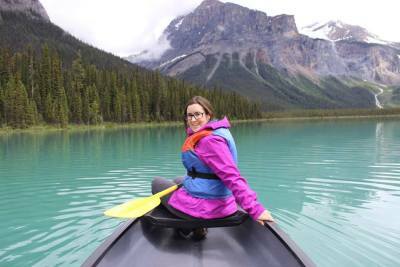 What kind of Canadian do you think I am? A couple of months ago I picked up a mini doughnut baking tray from Goodwill for $5. “When are you EVER going to use that,” asked the 3-year Canadian. Oh ye of little faith, David. I must say, I was a bit concerned when I started making the doughnut mix. The batter seemed so much thicker than I’m used to for cookies, cakes or breads, but I decided that if it didn’t work, we’d just start again. Turns out the thick mixture was perfect, so don’t stress if you have the same concern. Mix all the dry ingredients together. Now, you can whisk all the wet ingredients together in a separate bowl, or you can go the one-woman-one-bowl direction, like I did, and just make a little hollow area in the centre and throw your wet ingredients in there. Mix, mix, mix and you have yourself a batter. 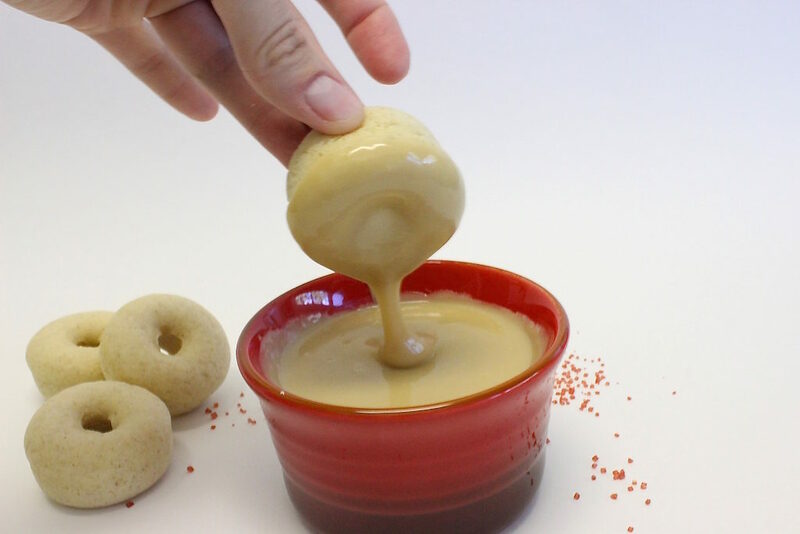 Now, how to get this thick beast of batter into the mini doughnut pan? I suggest piping it in. Don’t have a piping bag? No problem! Grab yourself a large Ziploc bag and fill it with batter. Aim for one corner in particular. I find it easiest to begin by folding the edge of the bag over, so that you’re not getting excess batter on parts of the bag that you won’t use. Remove the air, zip it up, twist the excess plastic together and aim for one corner. Cut a small slice off the end with a pair of scissors and bing, bang, boom, you have yourself a piping bag. Fill the doughnut holes 2/3 of the way up, as they will rise when baking. Cook for anywhere from 8-12 minutes, depending on your oven/altitude. Essentially, you should be able to poke the doughnut and it should spring back. 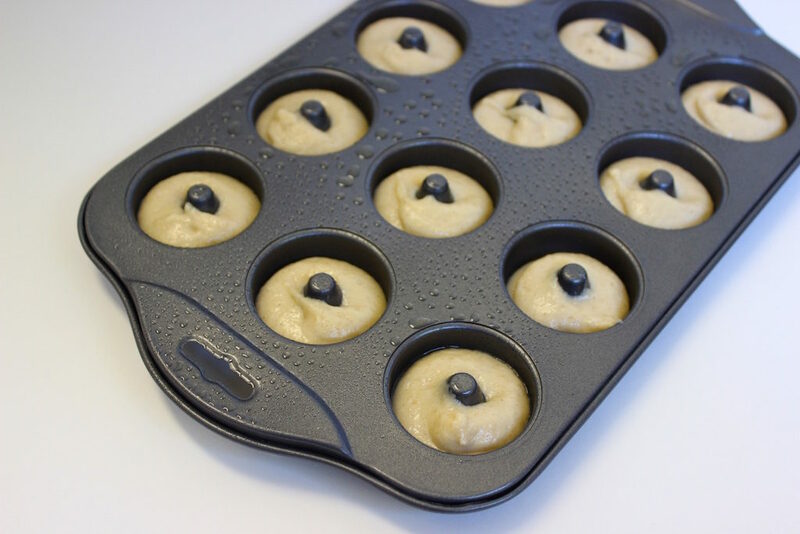 Remove from the pan (if you’ve greased the pan, they should come out easily) and cool on a wire rack. 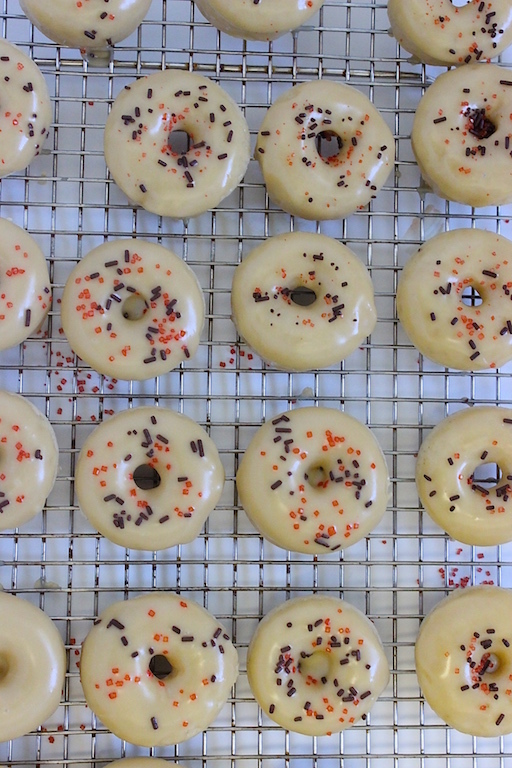 While they cool, make the glaze. Whisk together the icing sugar, melted butter and maple serious. Beware… it’s hard not to lick the bowl. 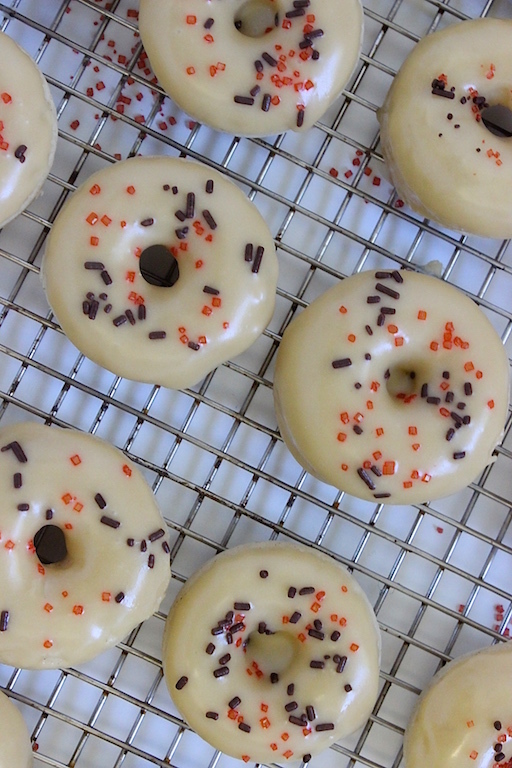 By this point, your doughnuts should be cool enough. Dip one side (or the whole thing, if you’re a major glaze kinda gal), into the glaze mixture, then return to the wire rack. 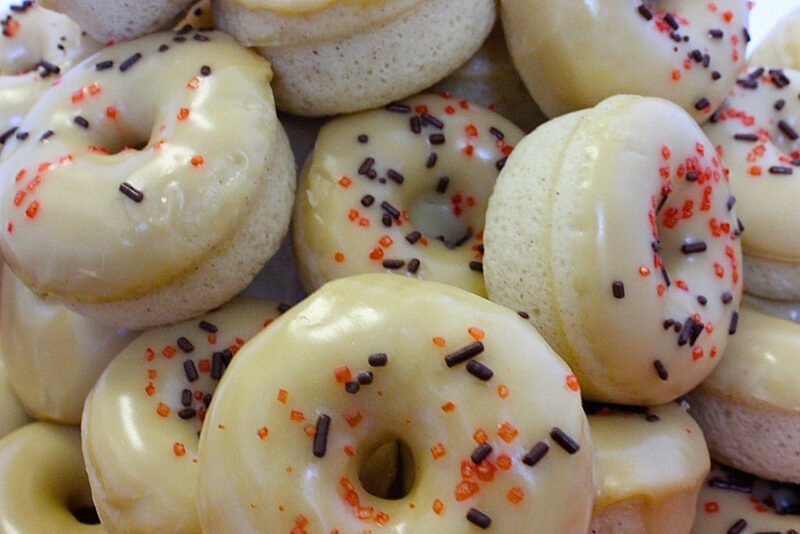 To save wiping up your countertop after, I suggest you put a paper towel or two beneath the rack, as you will have drops of delightful maple drip down the doughnuts. 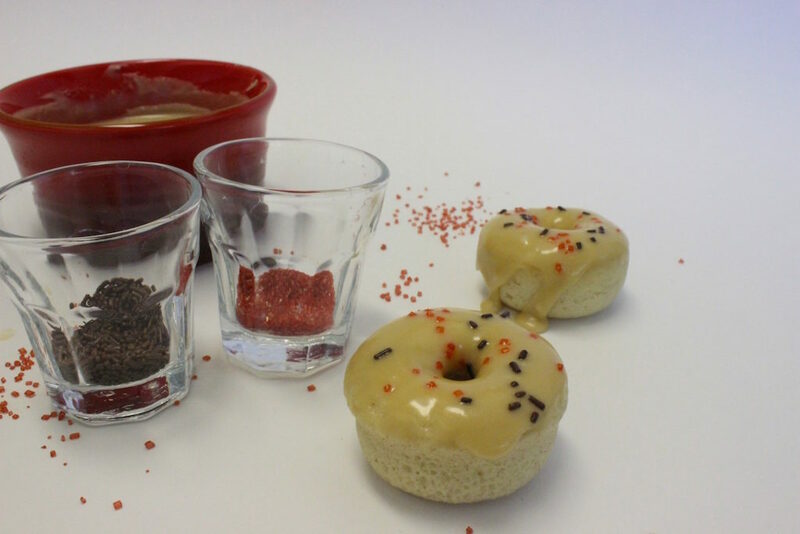 You can leave them simply like this, or you can add sprinkles, like we did, for that sense of whimsy and the Canadian red. 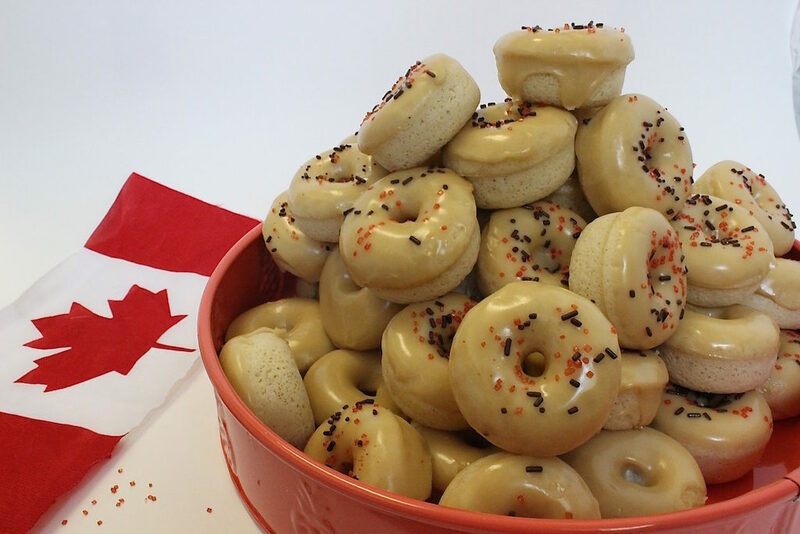 Basically these doughnuts are great for any time of year, but if you’re a Canadian abroad, celebrating Canada day, or celebrating getting your Canadian citizenship or similar, these doughnuts make you feel your Canadian-ness to the core! Enjoy! If you want to save this recipe for later, why not add it to Pinterest here?